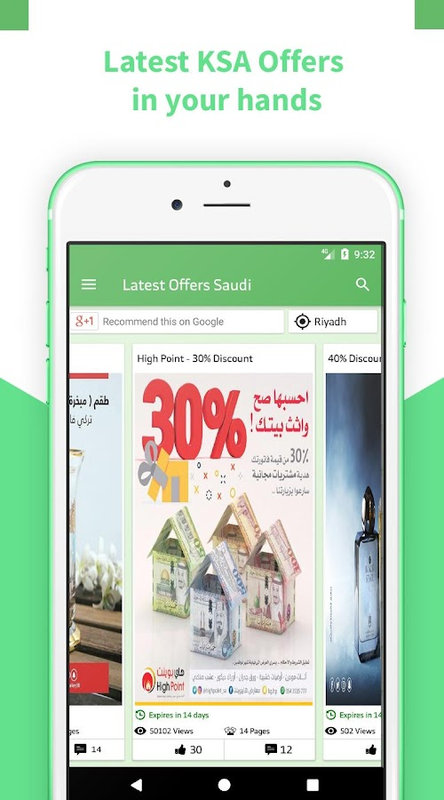 Offers and discounts of Saudi ArabiaOne place gives you plenty ofsavingsDiscounts exceeding one thousand Saudi riyals in somecommoditiesAn application that brings you all the offers of themost famous Saudi stores in one placeWith this application you cancompare the real discounts from the unreal offers so you can makethe right decision to buy from the best bidderOffers of Al Othaim,Saudi Arabia, Carrefour and many more. We put them all in yourhandsA wide variety of exhibits, including food, electronic, traveland other itemsThe largest group of famous malls and brands inSaudi ArabiaThe possibility of putting the special offer in thepreferred offers list to make it easier for you to compare it withother places in order to find the best price for yourrequestDownload now and be the first one to know of any discounts. اذا كنت تبحث عن تطبيق "رسائل عبد الاضحى "نضعبين ايديكم افضل التطبيقات مع اجمل رسائل عيد الاضحى المباركلترسلالى كل محبيك معايدة عيد الاضحى المباركالتطبيق يعمل على اجهزة الاندرويد ونقدم لكم ايضا افضل عيد الاضحى1436وافضل رسائل عيد الاضحى 2015.If you're looking for an application, "Abd al-Adha messages"Keepyour hands best applications with the most beautiful Eidal-Adha tosend messages to all your lovers Greeting Eidal-AdhaThe application works on Android devices and also offer you thebestholiday of Eid al-Adha in 1436 and the best festival in2015messages.If you're looking foranapplication, "Abd al-Adha messages" Keep your handsbestapplications with the most beautiful Eid al-Adha to sendmessagesto all your lovers Greeting Eid al-AdhaThe application works on Android devices and also offer you thebestholiday of Eid al-Adha in 1436 and the best festival in2015messages.If you're looking for an application, "Abd al-Adha messages"Keepyour hands best applications with the most beautiful Eidal-Adha tosend messages to all your lovers Greeting Eidal-AdhaThe application works on Android devices and also offer you thebestholiday of Eid al-Adha in 1436 and the best festival in2015messages. عن موقع وتطبيق عروض تطبيق يوفر لك مجانا إمكانية الاطلاع على أكبرعدد من العروض والخصومات في كافة المناطق عبر شاشة هاتفك، كما يتيح لكخاصية التنبيه لكل نوع من العروض ترغب في معرفته . رسالتنا توظيف أحدثالتقنيات الالكترونية للتقريب بين المنتج والمستهلك بما يحقق المصلحةللجميع . رؤيتنا الارتقاء بأساليب الدعاية والإعلان والربط السريعوغير المكلف بين المراكز التجارية وعملائها بما يواكب روح العصرويساير أحدثث التقنيات. أهدافنا 1- مساعدة المستهلك على توفير الجهدوالمال تمكينه من معرفة العروض القريبة من منطقته أو تلك التي تتصلبنوع معين من المنتجات أو الخدمات. 2- خدمة المراكز التجارية بتوفيروسيلة ميسرة وسهلة تتيح الوصول على نطاق واسع لما تقدمه من عروض أولابأول وأرشفة تلك العروض 3- إذكاء روح المنافسة الشريفة في ميدانالاقتصاد بكافة فروعه. والمساهمة في خدمة القطاع الاقتصادي وتطوره.الخدمات التي يقدمها الموقع والتطبيق يقدم موقع عروض والتطبيق المتصلبه الخدمات التالية: 1- تسجيل المراكز التجارية، وعرض كافة بياناتالاتصال المتعلقة بها من هاتف وعنوان وموقع على الخارطة وغيرذلك.وإتاحة ذلك كله للمستخدم. 2- يتيح للمراكز التجارية إمكانية نشرالعروض التي تقدمها لزبائنها بطريقة سهلة، وأرشفتها ويمكن المستخدم منالاطلاع على أحدث العروض أولا بأول. 3- يوفر للمستخدم ميزة البحث عنالمراكز التجارية والعروض التي تقدمها، من خلال المنطة أو نوع العروض4- يمكن المستخدم من الحصول على تنبيهات عند الإعلان عن العروض التييختار هو نوعها ومنطقتها. The location and the application offersApplication provides you with free access to the largest number ofoffers and discounts from all areas across your phone screen, andallows you to alert each type offers property you want to know. Our Mission Employ the latest electronic technology to bridgethe gap between the producer and the consumer to achieve theinterest of all. Our Vision Upgrading methods of advertisingand fast connectivity and costly between the commercial centers andtheir clients in line with the spirit of the times and faddishOhdtt techniques. Our objectives 1. Consumer help save effortand money to enable it to find out near his area or those thatrelate to a particular type of product or service offerings. 2.Service business centers provide affordable and easy way providesaccess to a wide range for its first offers the first and archivingof these offers 3. Raising the spirit of fair competition in theeconomy in all its branches field. And contribute to the economicsector and its development service. Services provided by thesite and the application that The website offers the applicationand the related the following services: 1. Registration of tradecenters, and all contact details of related phone, address andlocation on the map and Zlk.oatahh whole for the user. 2. allowscommercial centers offers the possibility of deploying it providesto its customers an easy way, archiving and enables the user to seethe latest offers first-go. 3. The user provides the search featurefor business centers and offers from, through or Almnth type offers4. The user can get alerts when advertising picks offers is uniqueand region.